1. Rotate the cylinder selector lever fully towards one of the cylinders. This is the “service” cylinder, (Cylinder A). The other cylinder will function as the “reserve” cylinder, (Cylinder B). Note: Both cylinders must contain propane; refill if necessary. Both pigtails must also be connected to the cylinders. 2. Open both cylinder service valves fully and wait until the sight indicator turns green. 3. Ignite two or three cooktop burners to create a “demand” or “load” on the pressure regulator. Take note of the visible flame structure. Leave these burners lit for the duration of the test. Note: Do not use the water heater or the furnace to create this “demand” on the regulator. They may satisfy their individual thermostats before the conclusion of the test. 4. 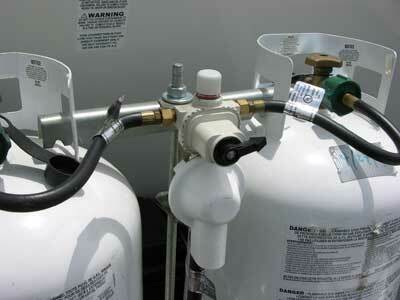 Simulate running out of propane by turning off Cylinder A, (close the service valve fully). The sight indicator should slowly turn red. 5. Once the sight indicator turns red, inspect the ignited cooktop burners. They should remain lit and look exactly as before. 6. Rotate the cylinder selector lever fully towards the “reserve” cylinder, Cylinder B. The sight indicator should immediately turn green. 7. Once the indicator turns green, disconnect the pigtail from Cylinder A. No fuel should emit from this disconnected pigtail. 8. If no gas flows out of the disconnected pigtail, reconnect it to Cylinder A and open its service valve fully. 9. Repeat Steps 1 through 8, beginning with Cylinder B this time. 10. If both cylinders respond as above, the automatic changeover regulator system is working normally. If propane leaks out of a disconnected pigtail or if the burner flames are extinguished at any time during this test, further troubleshooting is in order. 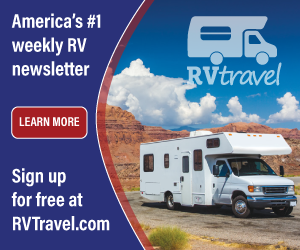 Contact a certified or master certified RV service technician.